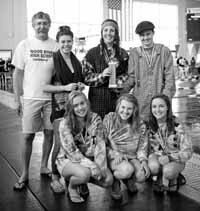 More than 400 high school swimmers from 51 schools pulled out all the stops Friday and Saturday, Nov. 5-6 during the State Swimming Championships at Boise City Aquatics Center in West Boise YMCA. In the end, the undefeated 5A Boise Braves finally stopped the five-year state winning streak of the Wood River High School girls—but the 4A Wolverines coached by Brian Gallagher clinched third place in the final team rankings. Second to Wood River last year, Boise (288 points) defeated last year's third-place Moscow (236) by a 52-point margin. Wood River (173) finished far ahead of fourth-place Bishop Kelly of Boise (138). Wood River sophomore Lena Friesen, who provided the Wolverines with their only individual gold medal last November, repeated her accomplishment by winning Saturday's final 200 IM race by over a second with a 2:08.48 clocking. Friesen also placed second in the 100 free final at 54.80. Friesen had been seeded third after Friday's 200 IM preliminaries but really turned on the afterburners in the finals. Colby Werley third in 400 free and fourth in 200 free; Elizabeth Fry fourth in 500 free; the relay team of Friesen, Fry, Tayler Bates and Werley third in 400 free and fourth 200 free. Other results: 7—Fry 200 free and Werley 200 IM. 10—Kelsey Syms 200 IM and Werley 100 breast. 12—Bates fly. 13—Syms 100 back. 14—Tori Emerick 100 back and 200 IM. The four Wood River boys ended up in 13th place overall, with Boise (273) sweeping the team honors by 67 points over second-place Lake City (207). Junior JT Sutton had strong sixth-place finishes in 50 free and 100 free. Adam Potts, also a junior, was sixth in 500 free and seventh in 200 free. Finishing 10th in the 400 relay was the team of Sutton, Gus Kimball, Potts and Bryce Ervin.